Before we get started, let’s acknowledge that there are a ton of names for a ping pong paddle, which can get a bit confusing, like paddle, racket, bat or racquet. Table tennis is regulated by the International Table Tennis Federation (ITTF) (https://www.ittf.com/). The official ITTF handbook (https://www.ittf.com/handbook/) calls it a table tennis racket. We use a bunch of terms in this guide, but don’t worry, they all refer to the same thing! 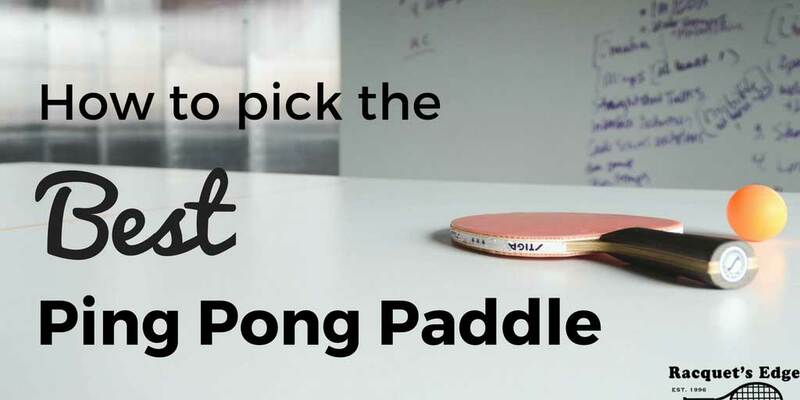 In this guide, we’re going to explain everything you need to know about buying a ping pong paddle, and how to select the right one for your playing style. Check the table of contents below if you want to skip the science and head straight to the paddle recommendations. What is a ping pong paddle made of? Types of Grip: How Do You Hold Your Paddle? What do those performance ratings mean? While you’re pondering over ping pong paddles, it’s helpful to first know what one is and the components that go into it. Sure, it’s not the most riveting part of the purchasing process, but by learning the different parts of a ping pong racquet, you’ll be able to select the right one for your skill level and playing style. Different table tennis blades. Most come with an attached handle. Handy! The blade is the main part of a paddle. It is usually made of wood, but official regulations from the ITTF allow it to also contain a small percentage of other fibrous material, like carbon fiber or compressed paper. To be competition standard, a table tennis blade must be at least 85% wood, and additional materials must be less than 7.5% of the total thickness or 0.35mm, whichever is smaller. You might be surprised to learn that a ping pong paddle can be any size, and shape or any weight, as long as the blade is flat and rigid. Blades usually comprise of 5 or more thin layers of wood or other material. 5-ply and 7-ply blades are most commonly found on the market, and the mixture of soft and hard woods and composite materials help to create a paddle’s performance. The main difference between carbon and wood is predictability. Wood is a natural material as is therefore non-uniform in nature. Simply put, a blade made from wood will be a little bit unique, but over time and with practice, you will learn its quirks and get used to it. Although all blades need to be at least 85% made from wood, the small percentage of carbon fiber will add some extra predictability to the paddle. Take a look at the STIGA Carbon racket – it’s crafted from a 7-ply blade, 5 made from wood and 2 from carbon fiber, which makes the bat more rigid and allows for increased speed and power. A 100% wood blade like the STIGA Evolution paddle is made from a 6-ply blade, making it very lightweight (170 grams or 6 ounces). Look at all the pimples! 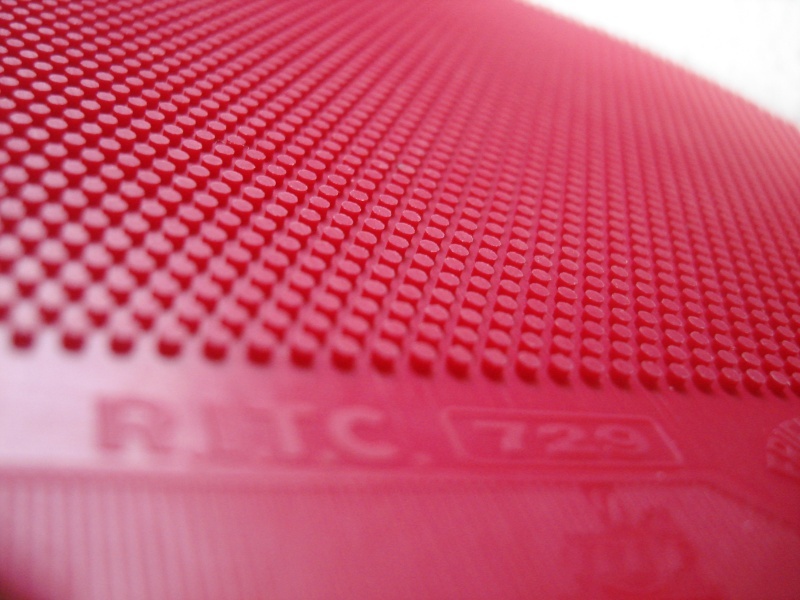 Single layer of non-cellular rubber, it can be natural or synthetic, with evenly distributed pimples (known as ‘pips’) with a density of between 10 and 30 per square centimeter. The pimples can face in (so you hit the ball with the pimples) or out, so the pimples face the ‘sponge’ (see Sandwich rubber below). Also known as pip rubber. 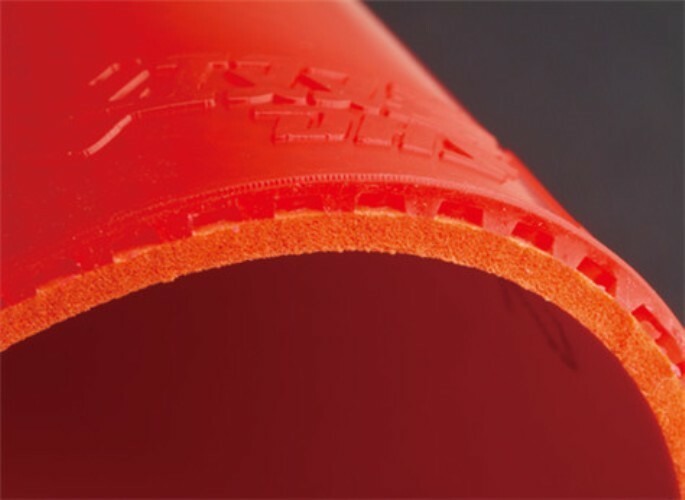 Single layer of cellular rubber (sometimes called a ‘sponge’), covered with a single outer layer of ordinary pimpled rubber, with pimpled rubber thickness of less than 2mm. The thickness and density of this sponge layer of rubber affects the speed of the ball. Thinner sponge = More control (because the ball is slower to bounce, giving you more time to react). Beginner players will need a paddle with more control, so a paddle like the Butterfly Timo Ball 1000 is ideal as it has only 1.5mm of sponge. On the flip side, more experienced players can experiment with thicker sponge. You’ll find most bats have 2mm of rubber. You’re allowed to have two different rubber coatings on each side of your table tennis blade, or you can choose to keep the front and back of the bat the same. If you’re buying anything other than a budget bat, look out for the ITTF logo on the rubber: this will indicate that the rubber meets ITTF competition standards so you won’t have to get too technical about the rubber thickness. Oh, and one more thing: the rubber has to be black on one side and red on the other. And it’s not just to look cool. The ITTF added the colour rule so that your opponents can tell which side you’re using (if your bat uses 2 different rubbers) and anticipate speed and spin better. Nobody knows exactly why red and black were the two chosen colors. Some bats are black on both sides or red and green – you can still play with these paddles but you’ll not be permitted to enter any official competitions so I wouldn’t recommend them for a serious player. The handle of a table tennis bat is attached to the blade. It can be straight, anatomic, flared or penhold, covered or uncovered, short or long – there are no regulations, it’s completely up to you. Paddle handles are usually shortened to FL (flared), ST (straight) and AN (anatomic). So how to do you choose which handle? There’s no easy answer and it really comes down to your personal preferences, but you can learn a lot from what other ping pong players have been doing. The Penhold handle is a short handle designed for players preferring the penhold grip. This is as simple as it sounds – holding the paddle like a pen (or pencil!). It’s popular with table tennis players from China and Hong Kong, like Wong Yun Chin, so much so that there’s a variation called the “Chinese penhold grip”. However, the penhold grip makes it difficult to apply backhand spin. A flared handle tends to be a little longer than the penhold handle and is well-suited to beginner players because the flared ends helps the paddle stay firmly in your hand (compared to a straight handle). It’s also the most common type of handle you’ll find on low- to mid-priced paddles. Flared handles are also more suited to players that don’t vary their grips often, and ideal for players who predominantly use fronthand play. For example, Butterfly’s Timo Boll range all have flared handles. While flared handles are great for forehand shots and beginners, straight handles are better suited to players who change their grips. The downside of a straight handle? It is more likely to slip in your hand, therefore making it slightly harder to control. The majority of professional players use straight handles. You won’t find as many straight handled table tennis paddles on the market, but some intermediate bats like the Killerspin Kido 7P come with a choice of flared or straight handle. You’ll also have more choice if you opt to buy a blade and customize your own paddle (see section below). Did I just say straight handles were hard to find? That’s nothing compared to anatomical handles! Anatomical handles are simply designed for comfort – they feel more natural in your hand. Anatomical handles, like flared handles, are suited to players who keep to the same grip. There are few differences between the two types, but flared handles are far more readily available. Many players also choose to use a racket with grip on the handle, to help provide better control. Typically handle grips are added to any paddle and don’t come with the racket itself. It’s usually called table tennis grip tape, like this Butterfly grip tape. Table tennis rubber is attached to the blade using glue. There are specific types of glue used in ping pong (not just normal superglue or craft glue), and a relatively new type of glue called speed glue was used by professionals before a match to increase the elasticity of their rackets, but it was banned by the ITTF in 2009. The final part of a ping pong paddle is the side tape, or edge tape, that seals the edges of the rubber and covers the edge of the blade. The thickness will depend on the thickness of the blade and rubber. Some players use power tape, which adds weight to the bat. The Penhold grip, as we covered earlier, involves holding the paddle like a pen or pencil. It’s a grip that was once popular with Chinese players, but is now far less common (according to the ITTF, none of the world’s top 20 ranked female players use it). The Shakehand grip is a simple grip that uses an outstretched index finger over the rubber and the rest of the fingers closed around the handle. It allows even power distribution for both forehand and backhand shots and is used by the majority of European professionals. The majority of professional and amateur players use some form of the shakehand grip. When you pick a ping pong paddle, go for a handle that suits your grip. The basic rule is the penhold grip require a penhold or short handle, while the shakehand grip needs a longer handle (which can be straight, flared or anatomical). If you haven’t already, study the above section on the different types of handle. The majority of beginners and intermediates use an all-rounder style of play. On a sliding scale, the more aggressive a paddle is, the heavier the racket is. For beginner players, opt for a mid-weight racket. More advanced aggressive players will benefit from a heavier racket. Don’t forget that you can also add power tape to pile on even more weight. Rackets can help you hit ping pong balls fast or slow. This will depend on the type and thickness of rubber that covers the bat. Much like with speed, the thickness of the rubber on your paddle will affect how much spin you can put on the ball – the thicker the rubber, the more spin you can generate. The design of a paddle will give you more or less control over the ball. There’s usually a trade-off between control, spin and speed: the more control you have, the less speed and spin you can create. A beginner should look for a high control rating, and then graduate to more speed and spin and they progress. TIP: Beginner players will benefit from greater paddle control if they select a bat with thin rubber (1.5mm). An intermediate player can progress to a thicker rubber as they master control and can start to add speed and spin into their game. While you’re searching for a ping pong paddle, you’ll probably start to notice a ‘ratings system’. Is there an official, standardized ratings system for ping pong paddles? No. The ratings are given to bats by their manufacturers so it’s impossible to compare performance between brands by looking at these numbers. The best way to compare paddles is to look at the detailed specifications individually – compare rubber thickness, blade composition, weight and handle type to find the right racket for your skill level and playing style. Yes, it will take you more time, but trust us, it is worth it! We’ve seen paddles marketed with 100/100 for control with thick sponges and rubbers – there’s no way that’s correct! To make the process a bit easier for you, we’ve created a table with 2oof the most popular paddles that you can sort by all the most important features. There are no prices on it (these change daily), but you can click the links through to Amazon to find out the latest information. Beginners need an affordable but reliable bat that allows them to improve their game and learn new skills. A good all-rounder is key. As a general guide, you shouldn’t need to spend more than $50 to get a high-quality beginner’s bat. Aways opt for a paddle that’s ITTF approved if you’re thinking about playing in a league. The entry-level Timo Boll racket from Butterfly is the 1000 and has an all-wood 5-ply blade, thin rubber (1.5mm) and flared handle, making it easy to grip and allowing for maximum shot control. Butterfly also make the 2000 and 3000 models for slightly more advanced beginners, so you work your way up to intermediate. As an intermediate table tennis player, you can start to think about finding a paddle that suits your playing style. The ultimate way to select the best ping pong racket for your game is to customize every element yourself. You will need to source the blade, rubber (2-faced if you like), handle, grip, glue and side tape separately and assemble them together yourself. This option allows to have to complete control over every little detail and tailor a racket that can take your play to the next level. 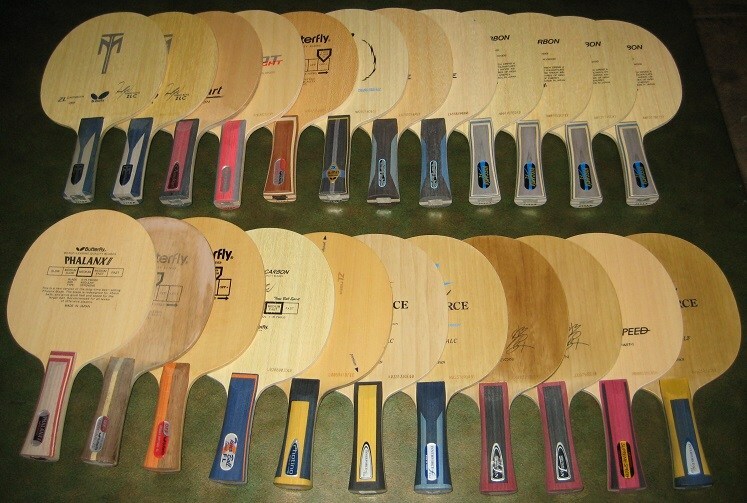 Custom paddles are recommended for advanced players, who are at competition level.